Leave it to the British masterminds who created the chip butty (fries in a roll) to also attempt the crisp (translation: potato chip) sandwich. 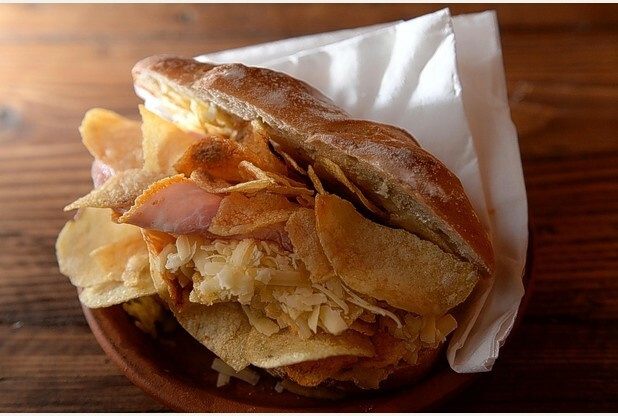 Yes, crisp sandwiches are now being sold at the Stock Exchange Bakery in Bristol. The bakery offers patrons the choice of granary bread or a white bun (baked fresh on the premises! and I’ve blogged before about how granary bread is the Best Bread on the Planet!) and a choice of 20 different crisps (the Brits have so much variety in flavors from roast beef to prawn cocktail and everything in between) to put inside. All this for £2.50 each. The Bristol Post reports that they’ve had queues around the block! Not since this sandwich have I been so intrigued. Sigh. Will someone report on this from across the pond? Is it as good as it sounds? Posted on 3, February 2015, in Food and tagged bakery, Bristol, British, crisp sandwich, crisps, food, granary bread, lunch, sandwich, Stock Exchange Bakery. Bookmark the permalink. 2 Comments. britrishThat sounds intriguing! What is in your tea travel kit? I'm Trish Marsom, a writer and anglophile, living in Sacramento, California.